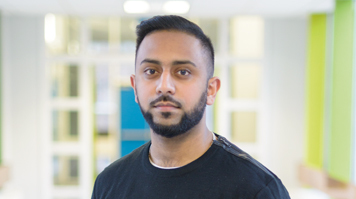 As an IT help desk worker in the NHS, Ali Akbar provides IT assistance to the Commissioning Support Units across Essex and in some parts of London. He makes sure that all the IT processes the units need are running smoothly, using bespoke software to provide administrative support. Ali went on to study our BSc (Hons) Information Technology, and graduated with a 2:1. His hunch was right; he credits his degree as being an important element when it came to finding his current role. He goes on to point out that some of the skills he learned outside of his studies have also been crucial. “The University gave me great opportunities with help for things like my CV, job hunting and internship opportunities,” he says. I actually carried out two internships with the help of LSBU – they really helped me to improve my CV and gave me vital experience that helped me secure the role with the NHS. It’s important to Ali that he enjoys coming to work, and in his current role, that’s something he certainly does. “I learn something new every day, and working in a big organisation means I know that I have plenty of progression opportunities,” he says. "I plan to stay in IT support for a while, gaining as much experience as I can. Once I’ve gained enough experience, I’ll be able to look for more senior roles in the same field." Read more about studying BSc (Hons) Information Technology at LSBU.